* LFO Clock Input : Syncing Arpeggiator and LFO to external drum modules and sequencers is now possible. As well, interesting feedback loops can be created. * PW Modulation Source Selection : Now you can choose a pulse width source. 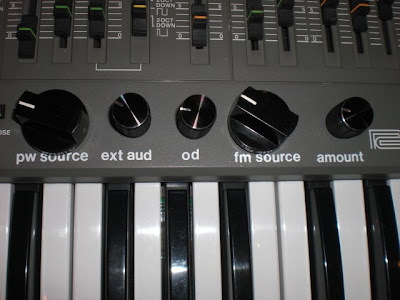 It is independent from the LFO's waveform setting. OSC sources are included. * External audio input : the ability to do FM of VCF by an externalaudio source or to simply route a signal into the audio path is now provided. * VCF CV input : Just plug in a foot pedal or a CV from a midi convertor and your sh-101 will sing! 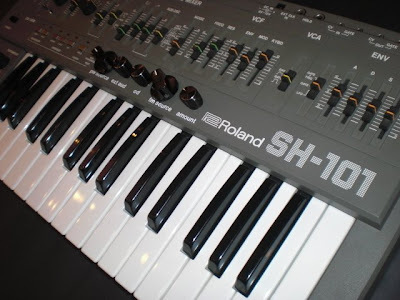 * LFO rate Scalar : Ever hear a bell sound out of sh-101? Try this on Hi! Want a really slow sweep...you got it too. Pulse width to near 0% - By closing the pulsewidth to a spike, new sounds can be attained by the sh-101. This "spike" wave source is very useful for brightening a bass patch. (A bass patch, with only the sub OSC waveform assigned, can be brightened, but not raise in pitch, by adding a little pulse width signal with a manual setting of less than 1% duty cycle.) In another other application, in which only full ramp waveform is assigned, manually raising and lowering the spike waveform's amplitude has been compared to sounding like a wavetable sweep. As well, LFO mudulation of the pulsewidth is made more dramatic because of the closer approach to 0%. Pulsewidth Modulation Source Selection - A six-way rotary switch enables you to choose the pulsewidth modulation sources independently of the LFO's waveform setting. This modulation source makes many new and interesting sounds. A randomly modulated pulsewidth is especially unique and pleasant. 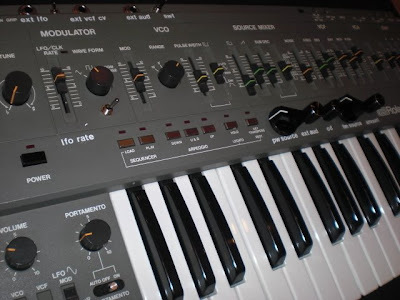 The PW modulation sources are LFO Triangle / LFO Square / LFO Random / Sub Osc -1 Octave Square* / Sub Osc -2 Octave Pulse* / LFO Noise *The sub Osc Mod sources creates a unique bass enhancement because of their higher frequency and keytracking. The result is a richer and deeper sound. As well, although there are only two sub Osc sources, changing the sub Osc switch -1/-2/-2 results in even further modulation effects. 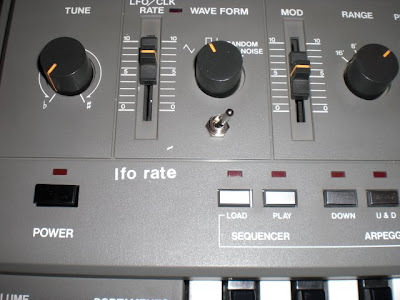 LFO Rate Scalar - A three-way toggle switch scales the overall range of the SH-101's internal LFO Clk (the existing lfo rate slider still functions normally). The scalar setting are Normal/Low/High. In the Low setting, a cycle of 40 seconds can be attained. This is great for mild changes in "trance" type music. In the High Mode, up to 1200Hz can be used to create interesting cross-mod bell like sounds. Perfect for "industrial" music and clanging metalic sounds. High mode works especially well when creating synthetic kick drum patch or short-wave radio sounds. LFO Clock Input - A 1/4" jack allows the insertion of an external clock signal to drive the 101's LFO. This injected signal triggers the LFO but does not change it's waveform. By applying a clock, LFO and Arpeggiator are both synced to the external source. This makes for very moving and groovy patterns with only a drum box and Mova-modded 101. A particularly nice application is to modulate the VCF cutoff with a Random LFO while playing the sequencer. Of course you can, at the same time, inject a seperate clock intot he arpeggiator via the 101's Ext Clk jack. This will enable you to run the arpeggiator and LFO at different speeds. As a bonus, audio can be injected to drive the LFO. A simple trick is to patch the headphone output into the Ext' LFO input. This feedback loop makes for sounds that can be mildly distorted to heavily distorted by simply adjusting the VCF's mod amount. (No need for an external distortion processor!) This effect is great for slow sweeps with a resonating filter setting. VCF CV Input - An external CV can be applied to the 101 via this 1/4" jack. This feature is typical on a Juno-60, Jupiter 4 and Pro-One. A MIDI controller converted to a cv or an "expression" foot pedal are typically connected one. VCF FM - VCF Fm is the most powerful NOVA-MOD feature. It can be used in moderation to simply add bringtness to a bass patch with low frequencies (due to subtractive synthesis). Or it can be used to create powerful cross-mod sounds that are difficult to explain....they must be heard. These sounds are somewhat aggressive, distorted, bell like but most importantly, not attainable on a regular SH-101. One example : Dial a patch with only ramp waveform assigned but at the same time, modulate the VCF Cutoff with the Pulsewidth. Manually change the pulsewidth to vary the FM effect. It is quite unique. You can then switch in Sub Osc -2 Oct. Pulse as the Fm source then adjust the -1oct/-2oct/-2oct switch to change the sound further. Finally swing the Pulsewidth waveform as the Fm source but switch from Manual to LFo modulation and then play with the PW Mod's waveform. 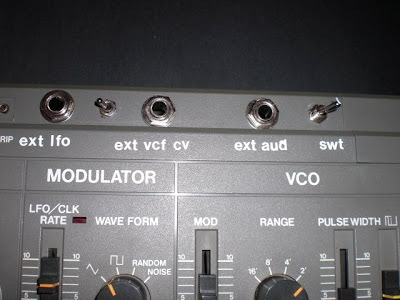 A rotary pot controls the amount of modulation. A six way rotary switch selects the FM sounce : Pulse / Ramp / -1 Octave Sqr / -2 Octave Sqr / -2 Octave Pulse / Noise Waveform"
hey does anybody know how to wire the dpdt switched jack for the ext lfo clock input ? i don´t understand the example they give in the nova mod instructions. is the tip of the jack supposed to go to where the pin2 on the ic should be and the ground to where pin 3 should be?